For more than 30 years, you've seen this sign on new driveways, patios, sidewalks and other surfaces in and around the metro area. Homeowners and business owners know us for our good service, attention to detail, and quality finish. 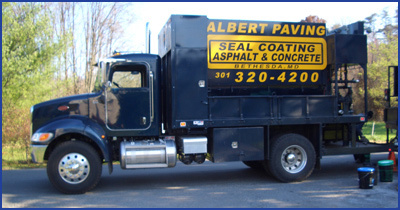 Albert Paving is an institution for generations of people in Bethesda, Chevy Chase, Potomac, Montgomery County, Kensington, Cabin John, Glen Echo, Upper Northwest Washington DC and surrounding areas, and we work hard to maintain our reputation and reliability. We have enjoyed extraordinary referrals for three decades, and work hard to exceed your expectations so that you, too, will refer us to friends and neighbors. Joe supervises every job and gives each one the attention it deserves. Albert Paving signs are posted in so many driveways because Joe Albert has built his reputation on quality work, attention to detail, and experienced professional crews that provide paving services that will last for years. We serve locals in Bethesda, Chevy Chase, Potomac, Montgomery County, Kensington, Cabin John, Glen Echo, Bradley Park, Burning Tree Spring Hill, Tulip Hill, Westmoreland Hills, Brookeville, Brookmont, Carderock Springs, Green Acres, River Falls, Rock Creek Hills, and Wood Acres in Maryland.